The original "Jolly Rogers" were from VF-84, but have an interesting squadron history. They were initally designated as VA-86 on 1 July 1955, but were redesignated to VF-84 on the same day! They were the second squadron to bear the VF-84 designation and bore the proud "Skulls and Crossbones" as their markings. They flew the F-4N Phantoms before transitioning to the F-14A Tomcat, but were decommissioned in the early '90s. They were also the squadron used in the Seagal movie, "Executive Decision", flying intercepts off the coast of Key West. This patch does not come with velcro attached. The original "Jolly Rogers" were from VF-84, but have an interesting squadron history. They were initally designated as VA-86 on 1 July 1955, but were redesignated to VF-84 on the same day! They were the second squadron to bear the VF-84 designation and bore the proud "Skulls and Crossbones" as their markings. They flew the F-4N Phantoms before transitioning to the F-14A Tomcat, but were decommissioned in the early '90s. They were also the squadron used in the Seagal movie, "Executive Decision", flying intercepts off the coast of Key West. This is the 1995 patch created for their decommissioning noting their legacy and history. VF-84 was one of the oldest US Navy squadrons before decommissioning and transferring their name to VF-103. VF-103 was established in May 1952 and began the transition from F-4S Phantoms to the F-14A Tomcat in January 1983. The 'Sluggers' were with the USS Saratoga in CVW-17 for the majority of her time, before switching to the USS Enterprise. VF-103 adopted the "Skull and Crossbones" of VF-84 to continue their tradition. VF-103 had one of their TARPS-birds shot down by an optical SA-2 derivative in Desert Storm with the pilot being rescued and the RIO becoming a POW. 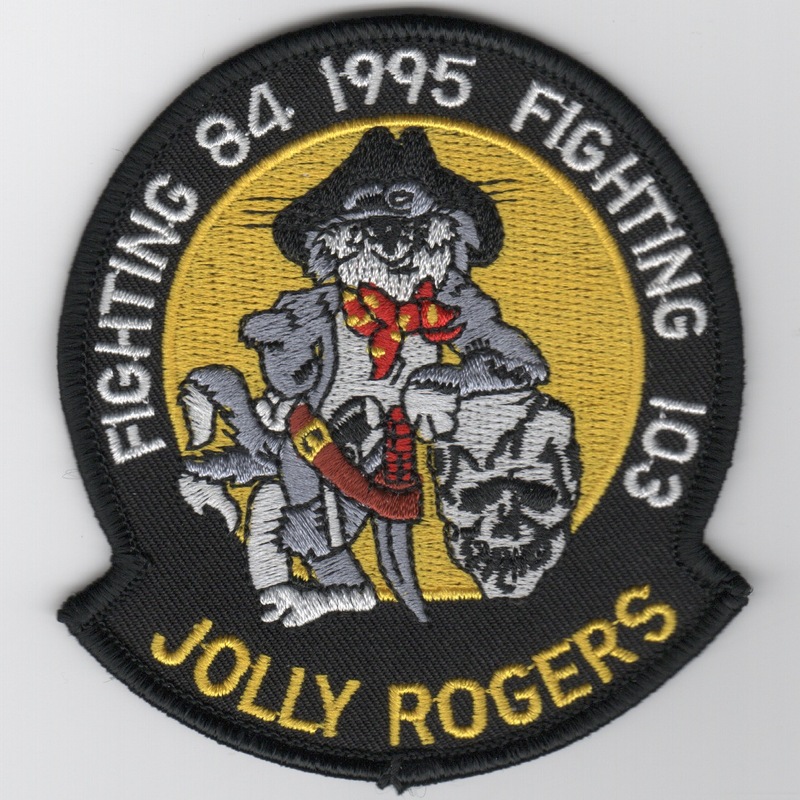 This is the "transition" patch created for the transfer of the "Jolly Rogers" name. 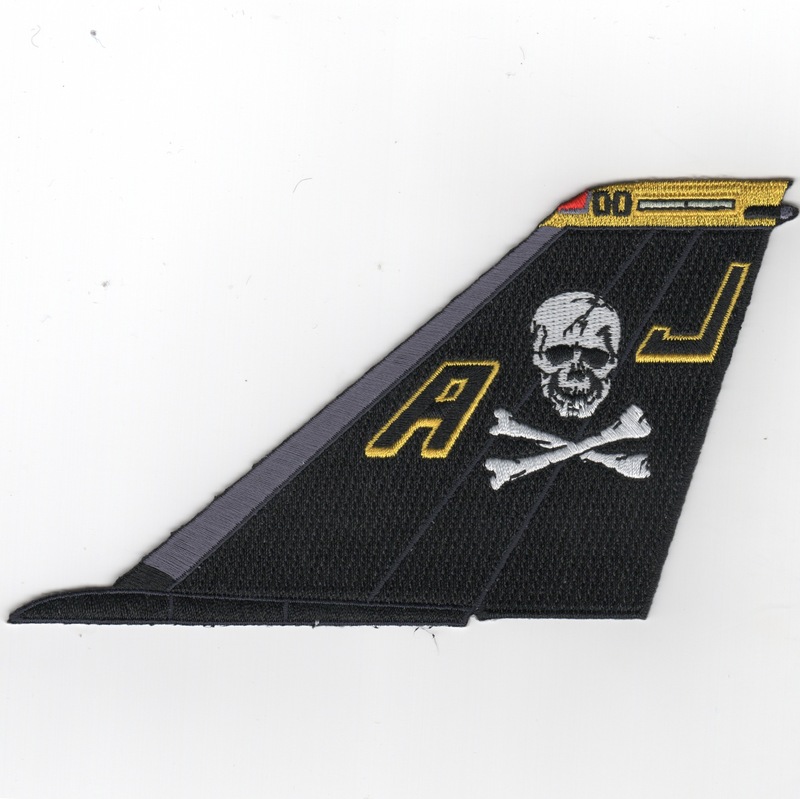 The original "Jolly Rogers" were from VF-84, but have an interesting squadron history. They were initally designated as VA-86 on 1 July 1955, but were redesignated to VF-84 on the same day! They were the second squadron to bear the VF-84 designation and bore the proud "Skulls and Crossbones" as their markings. They flew the F-4N Phantoms before transitioning to the F-14A Tomcat, but were decommissioned in the early '90s. They were also the squadron used in the Seagal movie, "Executive Decision", flying intercepts off the coast of Key West. 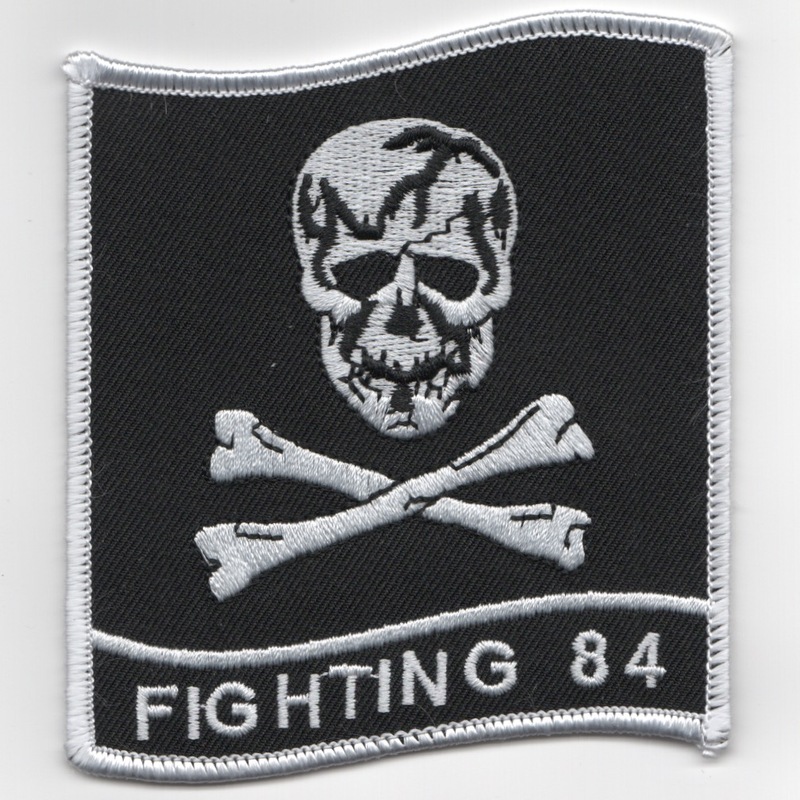 This is the "bullet" patch for the VF-84 "Jolly Rogers" showing the Skull and Crossbones, one of the oldest symbols in maritime history. This patch does not come with velcro attached. 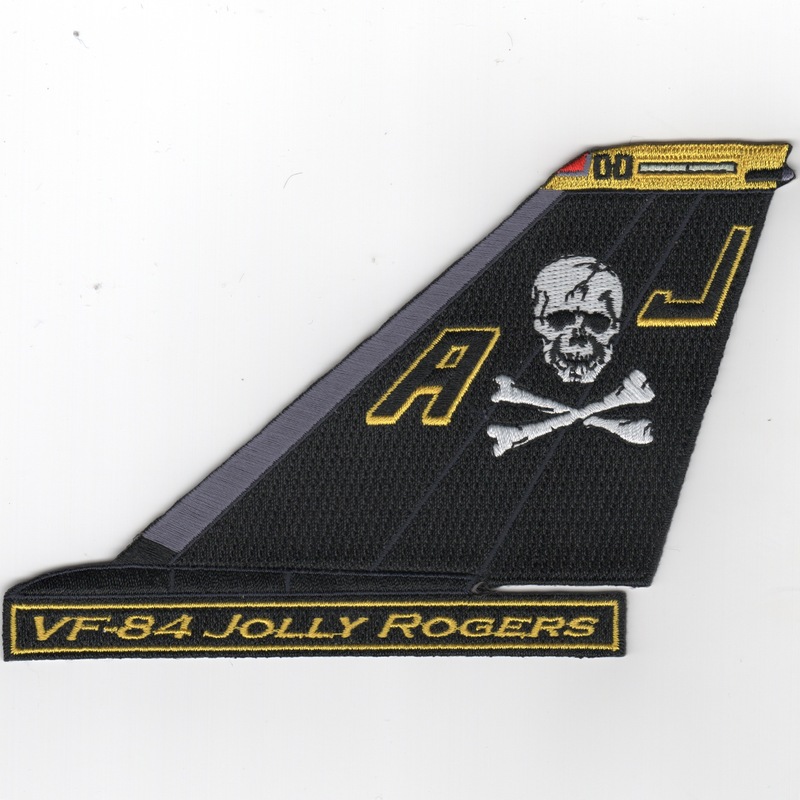 The original "Jolly Rogers" were from VF-84, but have an interesting squadron history. They were initally designated as VA-86 on 1 July 1955, but were redesignated to VF-84 on the same day! They were the second squadron to bear the VF-84 designation and bore the proud "Skulls and Crossbones" as their markings. They flew the F-4N Phantoms before transitioning to the F-14A Tomcat, but were decommissioned in the early '90s. They were also the squadron used in the Seagal movie, "Executive Decision", flying intercepts off the coast of Key West. 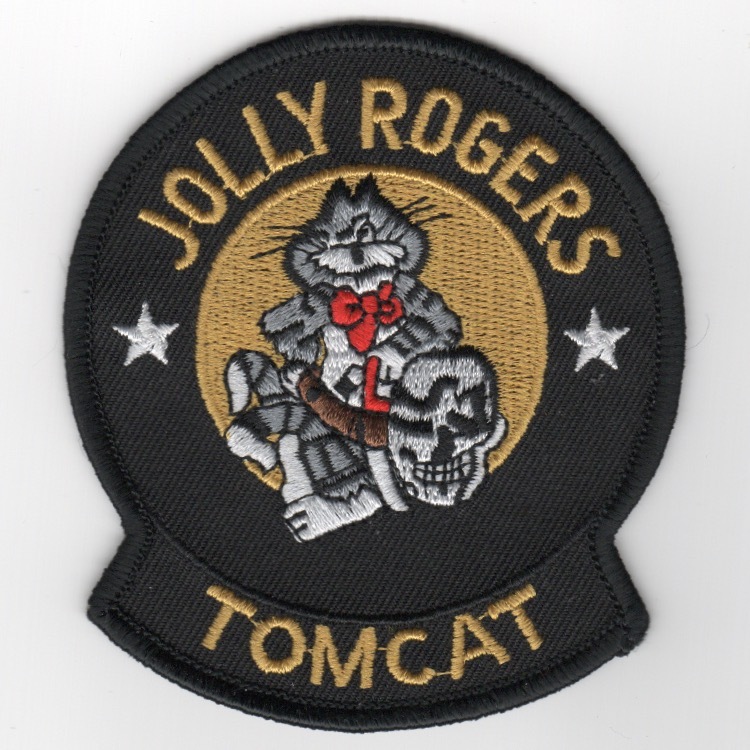 This is the black-&-white version of their Tomcat patch and it does not have velcro attached. 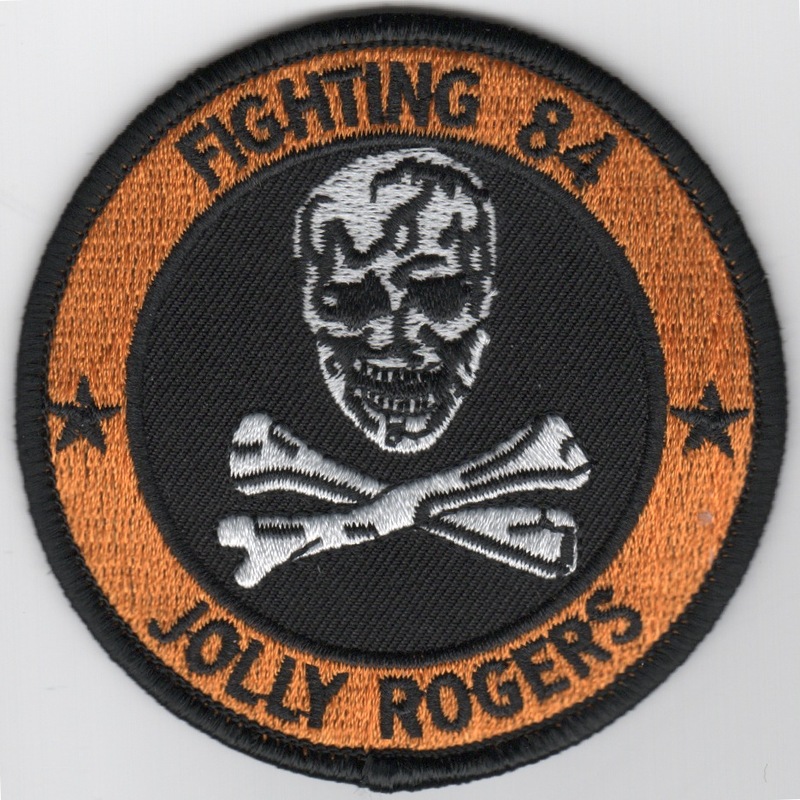 The original "Jolly Rogers" were from VF-84, but have an interesting squadron history. They were initally designated as VA-86 on 1 July 1955, but were redesignated to VF-84 on the same day! They were the second squadron to bear the VF-84 designation and bore the proud "Skulls and Crossbones" as their markings. They flew the F-4N Phantoms before transitioning to the F-14A Tomcat, but were decommissioned in the early '90s. This is the patch worn by the enlisted maintainers that were responsible for a particular jet. It was known as their "bird", and it is quite an honor to have one that you are responsible for. The original "Jolly Rogers" were from VF-84, but have an interesting squadron history. They were initally designated as VA-86 on 1 July 1955, but were redesignated to VF-84 on the same day! They were the second squadron to bear the VF-84 designation and bore the proud "Skulls and Crossbones" as their markings. They flew the F-4N Phantoms before transitioning to the F-14A Tomcat, but were decommissioned in the early '90s. They were also the squadron used in the Seagal movie, "Executive Decision", flying intercepts off the coast of Key West. Even though they were a TARPS squadron, they were still decomm'ed. This is the patch they wore denoting their photo capability. Homepage | Order VF-84 Patches!